Get ready to travel, SpongeBob fans. Holiday Inn has opened the first Nickelodeon�branded family resort by transforming its popular Holiday Inn Family Suites Resort in Lake Buena Vista into the 777-suite Nickelodeon Family Suites, commonly referred to as the �NickHotel.� The result is pure family travel nirvana. Evidently, the management at Holiday Inn felt that a partnership with this wildly popular television network would elevate the already successful property from mere family lodging to a true family destination and entertainment experience. Imagine this resort as sort of like a theme park combined with a sleepover. 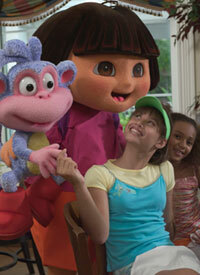 The sprawling resort is a great alternative to the Disney-themed lodging that your kids may have outgrown. The fun begins as you pull up to the exterior of the resort where oversized windows are wrapped with massive pictures of Nickelodeon cartoon characters that peer down at you. The Nickelodeon trademark, the giant orange splat abounds -- on the resort�s stucco buildings, on each white poolside lounge chair, even on the toiletries in the rooms. The resort received high marks from my ten year-old son Jamie, particularly for its two swimming pool complexes, each with its own water park. The Lagoon is the resort�s larger pool complex featuring a zero-depth entry pool. The real draw for kids is the massive four-story water tower with multiple slides, climbing nets, water jets and 400-gallon �sliming tank� � a huge water bucket that unexpectedly dumps pool water on those below. Very wet. Very noisy. On the other side of the resort is The Oasis, a slightly smaller pool complex that features pop-up water jets, another four-story water slide tower and a sandy play area with a smaller water slide for the little ones. Jamie preferred the Oasis water slide because of its long, steep net ladder inside a tube. The Oasis also had mom-appeal: far less crowded and noisy than the Lagoon, with a handy little snack bar offering treats for Jamie (nachos and Dip n Dots) and Mom (frozen grapes and smoothies). Throughout the day at both pools, perky NickHotel staffers called TeamNick Hosts beckon kids and willing parents to play Nickelodeon style poolside games. By the end of our visit Jamie was just warming up to these competitions, most of which involved whipped cream pies or bursting water balloons filled with slime (another Nick trademark). The Lagoon also has a complimentary, nine-hole mini-golf course, a netted basketball cage with several hoops of varying heights for all ages, a shuffleboard court and a couple of ping pong tables. 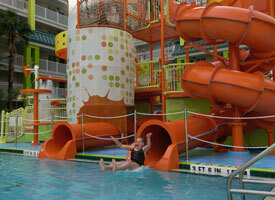 There is also a Kids� Play Area for the younger set with a five-foot water slide far away from the massive slide area. A poolside grill conveniently offers sandwiches, salads and drinks should you not want to abandon your lounge chair. The resort gets accolades from parents for the miraculous, never-ending supply of clean towels next to all pool areas and no pesky towel checkout system. In addition, all pools are well supervised by a vigilant lifeguard staff and children under four are required to wear protective swim pants (available for purchase). This is a resort rule that is strictly enforced but truly helps keep the pools sanitary and wards off any unnecessary pool closings. For those wanting to get out of the sun, The Mall is the resort�s indoor hub of activity �there are restaurants, a kids� spa, arcade, cyber station, food court, gift shop and Studio Nick for nighttime entertainment. The Kids Spa offers limited services such as hair wraps and braiding (starting at $20 and escalating quickly), manicures ($18), pedicures ($25) and airbrushed tattoos ($6 to $16 depending on design). Adult manicures and pedicures are also available ($22 and $35 respectively) by appointment. I considered getting my tootsies done until I realized there is no separate treatment room � the pedicures take place down a small hallway in plain view of everyone walking around The Mall. Not the zen-like spa atmosphere I am accustomed to. The Arcade is a 3,000 square-foot game room with plenty of the usual suspects such as skee ball, basketball free throw, and whack-a-mole, in addition to the dancing simulation arcade rocking the nation, Dance Dance Revolution! We became the proud owners of some iridescent fuzzy dice after Jamie�s several trips to The Arcade (guestimated cost of said dice: $20/ guestimated value: 40 cents). The Arcade also rents DVDs and Nintendo games for the systems found in every guest room. Next to The Arcade is NickZone a computer station with six or seven PC�s that access only Nickelodeon�s home page so kids can grab an empty seat and play online Nick games. If that�s not enough Nick, the adjacent NickStuff gift shop sells all kinds of Nickelodeon character paraphernalia. One afternoon we hiked over to The Mall to play a few rounds of bingo in the food court, which is offered a few afternoons a week. The silly Team Nick Hosts kept us amused as they good-naturedly heckled passersby between calling numbers. The Mall is also home to the resort�s two main restaurants: Nicktoons Caf� and The Buffet, as well as a food court with A&W, Pizza Hut Express and Barnie�s Coffee and Tea Company. We found the food in the Nicktoons Caf� and even the fast food eateries to be superior to The Buffet any time of day. The Nicktoons Caf� is particularly popular each morning when it offers a sumptuous buffet character breakfast (reservations strongly suggested). Popular Nickelodeon characters such as SpongeBob, Dora the Explorer; Angelica from Rugrats or Blue from Blue�s Clues circulate to provide plenty of photo opps, and servers break into the occasional song and dance routine between busing dishes and pouring coffee. With the exception of the Nicktoons Caf� Character Breakfast ($16/adult, $8/child 12 and under, plus tax and gratuity), the resort offers Holiday Inn�s "Kids Eat Free" program. As part of this deal, up to four kids twelve and under eat free from a special kid's buffet or menu with a paying adult. Also in The Mall is "Studio Nick", a state-of-the-art theater that is home to nightly Nick Live interactive shows (reservations necessary) with plenty of audience participation. The evening we attended, two families competed against each other as the audience heartily cheered for the family on their side of the theater. Competitions between the two teams ranged from simple Nick trivia to more active pursuits such as dressing up an adult team member as a giant baby, and perching them in a gargantuan highchair while tossing slime-filled balloons towards their highchair tray. At the end of several silly games like this, the winning team captain was placed in an inflatable baby pool onstage to receive their grand prize: a signature Nickelodeon sliming, of course! Much later in the evening (from 10:30 pm till midnight! ), Studio Nick is home to Kids Karaoke. We never stayed up late enough to check it out, but we heard that it was well run by the same high-energy Team Nick staff. Jamie and I shared a two-bedroom/one bathroom KidSuite that can sleep up to seven family members, albeit a bit cozily for that many people. There is a private master bedroom with king or queen bed, as well as a Nick cartoon-character themed second bedroom with twin beds or a set of bunks, plus a small pullout sleeper bed. This kid�s room is separated from the living area only by a curtain but includes its own television, Nintendo system, CD boom box and telephone. The living area has a sleeper sofa, rocking chair, 25� television, microwave, mini-fridge and sink. Three-bedroom KidSuites can sleep up to nine people since they have a second master bedroom and bathroom. This unit also includes a full kitchen with a stovetop range, dishwasher, and a full-size fridge plus dining room table � a real bonus for those wishing to spare some restaurant expense. For those traveling without children, the NickHotel offers two types of one-bedroom suites: a full kitchen version or a �Nick@Nite� style room with mod d�cor, right down to white leather sofas, bright blue carpeting and whirlpool tub in the corner of the living area (very Austin Powers!). If you are looking for a resort that offers some peace and quiet or �adults-only� zones, this may not be the place for you. But for a family with enough energy to spare after a long day at the parks, the NickHotel will surely fit the bill. This is especially true if your kids fall in the �tween� age category � when they act too old for Disney and actually are too young for teen programs. In fact, the NickHotel has so much kid-appeal that they might actually want to park it for a couple of days in lieu of another day at Disney. Nickelodeon and Holiday Inn feel that this hotel concept will apply to other family markets across the globe, but for now they plan to concentrate on making this flagship property a success. They are already off to a flying start. Complimentary shuttle service is available to all four Disney World theme parks, plus Universal Orlando, Sea World Orlando and Wet n� Wild. Just be sure to check the schedule so that you can get back to the hotel when you are ready � shuttles don�t run all night! Kids stay free in parents' room, and there is free wired high-speed Internet access in every suite. � Rates at the Nickelodeon Family Suites start at $149 in the low-season (August 28-September 30, Labor Day weekend excluded). It is worth asking about packages when booking since at press time, the resort was working on establishing some packages with the local theme parks. Be sure to ask for any additional discounts that might apply such as AARP, AAA, Florida resident, military or �MouseSavers�. For more information, call toll-free 866-GO-2-NICK or on the web at www.nickhotel.com. � If you are traveling with a teen, make sure to request twin beds in the second bedroom as opposed to the bunk beds which might be a bit small for some growing adolescents. � If you are traveling with small children with an earlier bedtime, book your room location carefully, as pool complexes close as late as 11pm and all suites open to outdoor corridors. You may want to forego the pool view and opt for a room overlooking the parking lot as it will be much quieter. � Don�t forget to call ahead (up to 90 days in advance) for Priority Seating at the Character Breakfast in the Nicktoons Caf�, particularly if you want to schedule an earlier seating so you can head to one of the theme parks after breakfast. -- Pat VandenHeuval has been writing about family travel for the past eleven years. Her favorite travel companions are her well-traveled 10 year-old son and 12 year-old daughter, both of whom profess a love for the smell of hotels, and a wanderlust husband who is always game for their next adventure.